The AQHF scholarship is offered to active members of the American Quarter Horse Association and American Quarter Horse Youth Association. The AQHF offers four types of scholarships: The General Scholarships, the Racing Scholarships, The Career Path Scholarships, and the State and Regional Scholarships. This scholarship is designed to be used for students in their sophomore, junior and senior years of college. There will be 27 scholarships awarded in the amount of $8,000 and the scholarship is renewable. There are a variety of scholarships through the General Scholarship program. These scholarships are for both graduate and undergraduate students. Students for these scholarships need to be members of AQHA state affiliate, 4-H, FFA, or local play days to apply. These scholarships are provided to students who major in racing-related degrees such as racetrack management or veterinary medicine. The Racing Scholarship is available for all college level degrees. Career path scholarships are provided to students who are studying horses and the horse industry. Career paths may include degrees in animal science, therapeutic riding and veterinary medicine. State and Regional Scholarships are available to students who are considered to be youth affiliate ambassadors. Indiana is one of fifteen states that offer the State and Regional Scholarship. Applicants must be members with the American Quarter Horse Association and American Quarter Horse Youth Association for at least three cumulative years of member. Applicants must be in senior year of high school. Applicants must have a grade point average of 3.5 or higher. Applicants must have a financial need for education. Applicants must demonstrate outstanding leadership and communication skills. Applicants may not already in enrolled in college are not eligible. Applicants must provide their application, school transcript, personal references, and financial need assessment. Carson Scholars Fund awards $1000 in college scholarships to any student in grades 4-11 who have demonstrated high academic levels and serve their communities. Students must be nominated by the principal of their school. The student must have 3.75 GPA and display humanitarian qualities through community service. These scholarships are earned through academics and community service not financial need or ethnicity. Applications need to be requested by school administrators. The educator or administrator selects the scholar to nominate. Indianapolis Public School is currently participating in the Carson Scholars Fund. The Cecil Armstrong Foundations offers financial assistance to students who are improving their skills or attending accredited colleges or certified education programs. The recipients of the scholarship are selected by committee. The scholarship may be used for an accredited college, vocational school, rehabilitation training, or other accredited or certified program. The minimum amount of this award is $250. The maximum award amount is $1000. Applicants must be a resident of Kosciusko County when he graduates from high school. College-student applicants must provide their SAT, ACT, PSAT, or equivalent exam. Applicants must submit a transcript with a 3.0 average. Applicants for vocation, rehabilitation or other training programs must provide evidence of skills and ability to pursue their course. Applicants may reapply for this scholarship for continued assistance. Applicants must submit their completed application, copy of FAFSA Student Aid Report, including the Expected Family Contribution (EFC) number, copy of high school transcript, SAT or ACT score, or a copy of their college transcript, and three current letters of recommendation (one from a teacher or professor and two non-school references). Applications vary by regional organizations. The Congress-Bundestag Youth Exchange offers a full scholarship to study in Germany for Young Professionals as part of an exchange program that includes full funding (less incidentals) to study in Germany. The program sends 75 American students to Germany for one year. The agenda includes two months of intensive German language study, four months of classroom instruction, and five months of internship in the participants’ career field. Young professional adults study business, vocations, science, engineering, technical, and agricultural fields in Germany. Recipients are expected to find internship positions with the help of the Deutsche Gesellschaft fur Internationale Suzammenarbeit. The scholarship includes funding for one full year, round trip flight, university tuition, language training, a living stipend, program-related travel, health and accident insurance, and membership in the CBYX Alumni Network. Applicants must be United States citizens, nationals, or permanent residents. Applicants must be current high school students between the ages of 15 and 18. Applicants must demonstrate qualities such as ability to adjust to other cultures. Applicants may apply online through the Congress-Bundestag Youth Exchange website. The Medical Group Management Association (MGMA) provides a list of available scholarships for students who are interested in pursuing a degree in health care management and administration. Applicants must be in an undergraduate or graduate program in the medical management field that includes public health, business administration, healthcare administration and related fields. These scholarships are only for health care leadership positions and not medicine, nursing, or allied health. Applications become available January 1st and the application deadline is May 1st. Or ACMPE Scholarship Fund, Inc. The Nina Mason Pulliam Legacy Scholars program is designed to provide financial assistance to students who are not normally eligible for other scholarship program. There are three specific target groups who may receive this grant. Adults who are 25 and older with dependents, college-age students and adults with physical disabilities, and 18-25 year olds who have been raised in the welfare system but must pay their own way. This trust was set up for residents of Arizona and Indiana. The Selma McKrill Brown Scholarship is designed to provide financial assistance for anyone who is pursuing their college education, business school, vocational training, professional training programs, or any accredited course. Recipients are determined by a scholarship committee after reviewing the applicant’s scholastic record, financial needs, Armed Forces record (if applicable), and goals. Applicant must be a resident of Kosciusko County, Indiana, when they graduate. Applicant must be an active member of a church. Applicant must submit two current letters of recommendation. One recommendation must come from the high school principal and the other recommendation must come from the pastor of her church. Applicant must turn in a copy of their FAFSA Student Aid Report. Applicant must turn in a copy of their EFC. Applicant must turn in a copy of their high school transcript, SAT/ACT score and any college transcript if applicable. Applicants may re-apply for continuance of this scholarship. The State Student Assistance Commission of Indiana (SSACI) has a number of grants available for college students. The process for beginning each of these grants is the same, students must apply through the Free Application for Federal Student Aid (FAFSA). The FAFSA is the main application form for various kinds of student assistance through both the State of Indiana and the federal government. The following is a brief description of the grants and explanation of who qualifies for each type of grant. The Frank O’Bannon Grant (previously known as the Indiana Higher Education Grant) is designed for students to attend eligible postsecondary institutions and receives its funding through appropriations made by the Indiana General Assembly. The grants pay for tuition and other educational fees. These are need-based grants and do not need to be repaid. The dollar amount every grant may vary from year-to-year. Applicants must be a United States citizen or eligible noncitizen. Applicants must attend or plan to attend an eligible college or university. Applicants must be enrolled or plan to enroll in a college program leading to an associate’s degree or first bachelor’s degree. Applicants must be a full-time student or plan to enroll as a full-time student (full-time is at least 12 credit hours per term). This program is in conjunction with the Frank O’Bannon Grant. The program is designed to help students work during the summer by encourages potential employers to hire students through the grant program. Applicants must be recipients of the Frank O’Bannon Grant by the academic year prior to the summer. Applicants may not be graduating before August 31st of the year they work through the program. Applicants must intend to enroll as an undergraduate student in the fall following the summer they work in the program. The Twenty-first Century Scholars is designed for students and their income-eligible families to begin planning early in their education. Student enroll in the program as 7th and 8th graders and are provided with assistance for up to four years of undergraduate tuition at participating public colleges or universities in Indiana. The actual dollar amount may vary according to state budget constraints and the families’ ability to pay. This grant is provided on an as-needed basis but ensures some assistance for attendance at a participating college. Applicants must be in the 7th or 8th grade to apply. Applicants must participate in an academic success program. Applicants must graduate from high school with a GPA of 2.5 or better. Applicants must be a member of a qualifying family that is based on the family income. Applicants must use the scholarship within one year of high school graduation. Applicants must maintain a 2.25 GPA or better through their sophomore year of college. Applicants must maintain a 2.50 GPA or better through their junior and senior years of college. In conjunction with the Twenty-first Century Scholars Grant the GEAR UP program is designed to ensure students are prepared for college level work. The Nursing Scholarship Fund is awarded to nursing students who agree to work as registered nurse or licensed practical nurse for at least two years in an Indiana health care facility. The annual scholarship is $5,000 and can only be applied toward tuition fee and other college expenses. The exact dollar amount will be determined by the colleges. Applicants must be admitted to a college or university as a nursing student. Applicants must attend as full-time students (12 hours or more) or part-time (6-11 hours) as a nursing student. Applicants must be an Indiana resident and United States citizen. Applicants must agree by contract to work as a nurse in an Indiana care facility for at least the first two years after graduation. Applicants must show a financial need. Applicants must have a GPA of 2.0 or higher and meet the college’s minimum GPA requirement for the nursing program. Applicant may not be in default of state or federal student loans. Applicants for the nursing scholarship must apply through FAFSA as well as an online application through the Office of Financial Aid at the college the student attends. The Minority Teacher/Special Services Scholarship is designed to help students who are pursuing a teaching certification, special education certificate, and occupational or physical therapy certificate. Only minority students who are pursuing their certificate in teaching may apply for the Minority Teacher Scholarship. All students may apply for the special education certificate and occupational or physical therapy certificate grants. The scholarship is renewable. Applicants must be a minority student and pursuing a teaching certificate; or any student pursuing a Special Education teaching certificate, or Occupational or Physical Therapy certificate. Applicants must be an Indiana resident and eligible United States citizen or permanent resident. Applicants must be admitted to an eligible college as a full-time student. Applicants must pursue an education that leads to a teaching certificate, special education teaching certificate, or occupational or physical therapy certificate. Applicants must not be in default of a state or federal student loan. Applicants must meet all other requirements of SSACI. Applicants who are renewing must maintain a cumulative GPA as required by the college for their program. Applicants must maintain a 2.0 GPA or higher if the school does not require a minimum program GPA. Applicants must apply for the grants each year. The Indiana National Guard Supplemental Grant (NGSG) provides with up to 100% of their tuition fees if they are members of the Indiana Air and Army National Guard and only at certain colleges. The grant may only be used for fall and spring semesters. Applicants may not have been AWOL from duty at time during the 12 months prior to enrolling in college. Applicants must complete ING paperwork and have it approved by the appropriate ING office. Applicants must apply through FAFSA each year. Applicant must be used for an associates or bachelors degree at an eligible college or university. The Part-time Grant Program is designed to help students are attending a college or university on a part-time basis but demonstrate a commitment to complete their degree or certification. The grant is based on financial need and is awarded per term. The recipient may receive the grant for all terms in a single academic year. This grant provides assistance for the children of disabled Indiana veterans. Eligible children and spouses may also include families from Indiana National Guards and Indiana public safety officers who killed in the line of duty. The grant may be used as a supplement to other grants and pays 100% of the tuition fees and other college fees. The grant pays a maximum of 124 hours. Applicants whore are covered under the Veterans portion includes the children of deceased or disabled veterans as well as the children of POW/MIA from the Vietnam War. 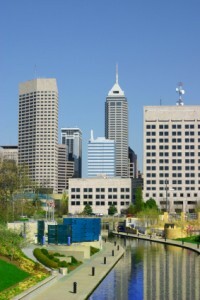 Applicants must meet Indiana residency requirement. Their veteran parent must also have met residency requirements. Applicants must be the biological or adopted child of the veteran. This scholarship is provided to students who graduate from a publicly supported high school one year early. The grant pays $4,000 toward tuition and college fees and can be used by any eligible Indiana college. Applicants must be a resident of Indiana. Applicants must have attended a publicly supported high school. Applicants must have met the minimum graduation requirements by the end of their 11th grade. Applicants must be in good standing at the college they are attending within five months of their college attendance to retain the grant. Students submit their application materials for admission to be considered for Automatic Academic Scholarships, with the exception of those applying to the Jacobs School of Music. There are no other application forms to complete and submit. The student’s SAT score is based on the Critical Reading and Math portions. The ACT score is based on the highest composite score. These scholarships are renewable for all four years of undergraduate work as long as the student maintains a 3.0 GPA. Applicants to the Jacobs School of Music will be considered for scholarship based on two criteria: academic excellence and an audition or interview. Applicant must have a minimum SAT score of 1340 or minimum ACT of 30. Applicant must have a minimum GPA of 3.80. Applicant must be an out-of-state student (domestic and international). Applicant must have a minimum SAT score of 1340 minimum ACT of 30. Applicant must be an Indiana resident or out-of-state student. Applicant must have a minimum GPA of 3.7. The Valedictorian Award is awarded to students in the state of Indiana who are ranked as top of their class. All students who complete and submit an application for admission by the deadline are considered for Selective Scholarship eligibility. Eligible students are notified by mail and in their admission packets. They will need to complete the application process and provide letters of recommendation for further consideration. The Hudson and Holland Scholars Program (HHSP) scholarships are designed for residents and non-residents of Indiana. The goal of the scholarship to assist underrepresented students such as African-American, Hispanic, and Native American students achieve their educational goals in the Indiana University system. The annual scholarship amount is normally $6,000 per year with additional incentives based on academic excellence. There are also a limited number of scholarships for students who have already completed one or two years of college. 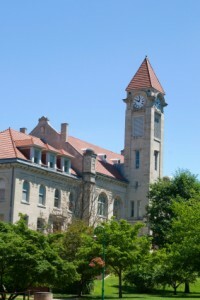 The academic requirements for transfer students or students already enrolled in Indiana University are the same as freshman applicants. Applicants must have a 3.2 GPA. Applicants must rank in the top 20% of their high school. Applicants must have a combined SAT math and verbal score of 1100 or an ACT score of 23. Applicants must complete a college preparatory curriculum. Applicants must have a record of leadership or active participation in community service activities. Applicants must be United States citizens or be eligible for federal financial aid. Applicants must demonstrate a commitment to working with underrepresented populations. High school students must apply to the University through the Office of Admissions. Students who are admitted to the university will receive a Selective Scholarship Application in their admission packet.